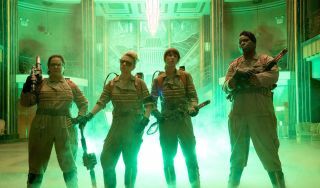 When the first trailer for the Ghostbusters reboot landed earlier this year, it was met with mixed reactions. Some folks flat out loved it - us included - while many were displeased with how Sony's marketing team cut together the footage. And then there's the community of Ghostbusters purists who made it a point to voice their sheer outrage at the very existence of the movie itself. It's that disgruntled group who've contributed to the film's first spot of record-breaking: the trailer is now the most disliked trailer in You Tube history. At time of writing, it has 652,639 dislikes. That's a staggering number of viewers who are unhappy with this first glimpse of Paul Feig's movie. As Screen Crush points out, this vast amount of dislikes is part of a "coordinated attack" by a community who can't tolerate the film for a number of reasons. Certain individuals are even pushing to get it up to 1 million dislikes. If you take a quick glance through the comments section, they appear to be divided into two camps. There's the 'female Ghostbusters? that's wrong!' responses, and a thinly-veiled variation of the same idea - 'I'm not against women, it just doesn't look funny, (and they're trying to be feminist which I don't like)'. They're disheartening to scroll through, especially because the movie isn't released and it's already being judged via some pretty nasty means. Obviously, everyone has the right to their opinion, but when the negative responses have nothing to do with the trailer and are purely focused on deriding its all-female leading cast, it's just bang out of order. "It's a reboot, not a remake. I know it's weird that they say [in the trailer] ‘30 years ago,’ but in this movie it's like the first one didn't happen. It's a great story but told totally differently. It's the same thing of four unlikely heroes, it's in New York City, ghosts are taking over. It's the same classic story, but it's not a '30 years later.’ … Believe me, the question was asked. I think it's very confusing." Directed by Paul Feig and starring Kristen Wiig, Melissa McCarthy, Kate McKinnon, Leslie Jones, and Chris Hemsworth, Ghostbusters opens in UK and US cinemas on July 15, 2016.